The only good news in the just-released 2013 U.S. trade data is that it can only reinforce growing congressional and public opposition to more-of-the-same trade agreements. The White House is promising a major push to obtain Fast Track trade authority to railroad the massive Trans-Pacific Partnership (TPP) through Congress. Next week, 10 days of TPP negotiations will start in Singapore. On February 22, U.S. Trade Representative Mike Froman and other TPP-nation trade ministers will meet to try again to hash out a final deal. Meanwhile, in the category of doing the same thing over and over and expecting a different result, the latest data show why TPP is a lunatic idea. TPP is premised on expanding the old North American Free Trade Agreement (NAFTA) model to additional nations. The U.S. opening proposals for TPP were based on the text of the 2011 U.S.-Korea Free Trade Agreement (FTA). The year-end 2013 data released by the U.S. International Trade Commission (USITC) show just how NAFTA and the Korea FTA are working out. There has been a stunning decline in U.S. exports to Korea, a rise in imports from Korea, and a widening of the U.S. trade deficit since the Korea FTA. 20 out of 21 months since the Korea FTA took effect, U.S. goods exports to Korea have fallen below the average monthly level in the year before the deal. 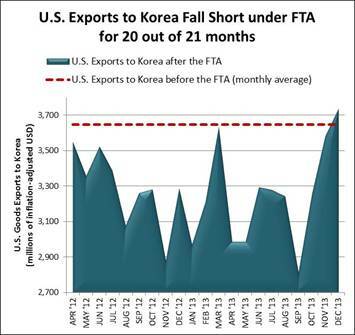 U.S. average monthly exports to Korea since the FTA are 12 percent lower than the pre-FTA monthly average, while monthly imports from Korea are up 3 percent. The monthly trade deficit with Korea has ballooned 49 percent compared to the pre-FTA level. These losses amount to tens of thousands of lost U.S. jobs. There was zero growth in U.S. goods exports relative to 2012, placing the United States decades behind President Barack Obama's stated goal to double exports in five years. Total U.S. goods exports in 2013 actually dropped slightly from 2012 after adjusting for inflation, revealing a negative 0.1 percent growth rate. 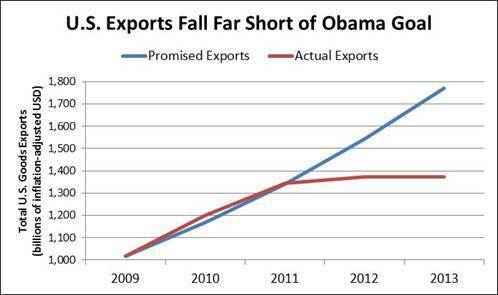 The data show there is no chance to meet President Obama's stated goal to double 2009's exports by the end of this year. At the paltry 1 percent annual export growth rate seen over the past two years, the export-doubling goal would not be reached until 2054, 40 years behind schedule. 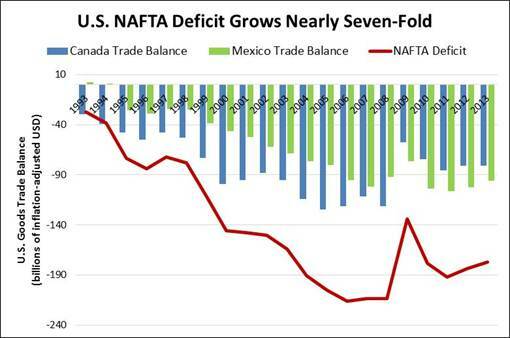 There is a staggering U.S. trade deficit with Canada and Mexico after 20 years of NAFTA. The 2013 U.S. goods trade deficit with Mexico and Canada was $177 billion -- a nearly seven-fold increase above the pre-NAFTA level, when the United States enjoyed a small trade surplus with Mexico and a modest deficit with Canada. Even worse for U.S. workers, the non-oil NAFTA deficit has multiplied more than 13-fold, costing hundreds of thousands of U.S. jobs. Indeed, the share of the combined U.S. trade deficit with Mexico and Canada that is comprised of oil has declined since NAFTA. The corrected data only adds fuel to the fire building against Obama's request for getting Fast Track trade authority. While the GOP House leadership is perversely keen to deliver this vast new power to the Democratic president they attack for announcing he will use the executive power he has, most House Democrats oppose Fast Track as does a bloc of House Republicans. The battle over Fast Track will be waged in the House. In 1998, 171 Democrats and 71 Republicans voted no and ended then-President Bill Clinton's quest for Fast Track powers. Now President Obama is calling House Democrats to ask for their support. Senate Majority Leader Harry Reid's recent announcement that he opposes Fast Track sent a powerful signal to congressional Democrats that they can say no. Just like today for TPP, in the past Congress and the public were sold on glorious projections of trade agreements' benefits. But the actual data show the projections were at best wrong and perhaps simply cooked. The White House and the corporate lobby are trying to sell Congress the TPP and Fast Track with the same old promises about export growth and job creation, but the 2013 data show empirically that expanding the old trade model will only result in larger trade deficits, more job loss and downward pressure on U.S. wages.